When I first found this recipe, I was really excited to try it out. I’m from Maryland and if you know anything about Maryland, its that we sure love our seafood. First in line is steamed crabs followed closely by steamed shrimp. If you’re not from Maryland and you’ve never visited here, then you have never had a Maryland crab cake. I don’t care if they called it a Maryland crab cake on the menu, I’m telling you, there is no way you had a Maryland crab cake. Just believe me! While steamed crabs is what Maryland is known for, you absolutely can NOT have steamed crabs without their awesome seasoning, Old Bay. A former Maryland knottie friend once said that people from Maryland just like to put Old Bay on stuff, and well, its true. Seafood, french fries, in mashed potatoes or potato salad, on chicken…basically whatever you can think of. I don’t believe I could live in a state that didn’t sell Old Bay, but luckily, with the invention of the internet, I’d at least be able to order it. So, what in the world is Old Bay is what you non-Maryland natives are thinking right? Well its this awesome zero calorie seasoning that makes seafood, well, seafood. The ingredients list is celery salt, spices (including red pepper and black pepper) and paprika. Yeah if I was McCormick, I wouldn’t allude too much to the ingredients either. But let me just tell you, its great. Really great! Ooo, can I tell you a funny story about crabs? I swear, I really am getting to the recipe, but you just need to hear this first. So, my friend Cassidy is from here and she moved to Virginia Beach for a while and was dating a guy from New York. He came and visited her family during the summer while they had steamed crabs. His response when they pulled one out “Don’t you wash that thing off first?” I laughed so hard I almost cried when she told me that story. I’m sure its not quite as amusing if you’re not from here, but just imagine this crab, covered in clumps of Old Bay spices, resembling dirt and this poor boy thinking that you actually ate the shell and legs of the crab. Not funny? Oh well, I’ll try again later. Here’s proof that I am by no means a perfect cook. We purchased cooked shrimp in a two pound bag from the grocery store last week because they were ridiculously cheap. Now all day I’ve known I was going to cook the shrimp bisque. But for whatever reason, I didn’t bother to look at the bag and I didn’t bother to take them out to dethaw either. So, after I had my veggies chopped, I pulled out the shrimp and realized not only were they frozen together, but they still had their tails on. Sigh. So, with the use of a really sharp chef’s knife I managed to chop off their tails, cut them into bite sized pieces and toss them in the microwave for a minute and a half to get some of the freeze off. However, I don’t suggest that you do this. When you go to make this recipe, you either need raw shrimp that you are going to steam, or frozen shrimp that have been dethawed and their tails removed. If you plan on steaming them yourself, follow the directions on a can of Old Bay. Honestly, I’d have no idea how else to steam said shrimp. So, do that. Or, if you live in the middle of nowhere and only have Emeril’s Essence, its a pretty close taste that you could use. Oh yeah, to make this you will need some form of a blender. Preferably one that can really chop things up and make them smooth. It creates a better texture for the soup. 1. In a large pot, add oil, red peppers and onion and saute for 15-20 minutes over low heat, or until soft. Stir occasionally. Add in the shrimp, tomato sauce, half-and-half, hot sauce, Old Bay, and salt and pepper. 2. Bring to a boil and then reduce heat and simmer for 5 minutes. Add the butter and stir until melted. 3. Pour the mixture into a blender and switch it to pulse. Let it run for 15-20 seconds or until no large pieces remain. 4. 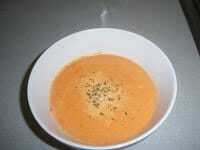 Transfer the soup into bowls and sprinkle Parmesan over the soup and garnish with parsley. Another note: If you want the soup to be thicker, I recommend a blender. If you don’t mind some shrimp chunks and a thinner broth, the stick blender works perfectly fine. Its also a pretty versatile meal. You could serve it as a first course, a main course, or even in shot glasses as shooter soup.